What are the indications for antireflux surgery? Discuss the principles of anti reflux surgery? The Nissen fundoplication is total (360 degree), but partial fundoplications known as Belsey fundoplication (270 degree), Dor fundoplication (anterior 180 degree) or Toupet fundoplication (posterior 180 degree) are other alternative procedures. Discuss the pros and cons of anti reflux surgery? 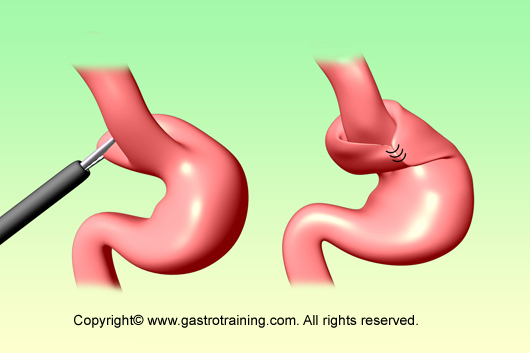 Most antireflux surgery is now performed laparoscopically with short duration of hospital stay (1-2 nights) and faster recovery (resume work in 1-2 weeks). 85-90% success rates in relieving symptoms and healing oesophagitis. Surgery is not superior to medical therapy in preventing complications of GORD such as stricture formation, development or progression of Barrett’s oesophagus, or development of adenocarcinoma. Discuss complications of anti reflux surgery? Dysphagia: postoperative dysphagia is not uncommon, but eases off within a few weeks. Dysphagia that persists requires further evaluation. Some may need dilatation; however patients with Nissen fundoplication may need revision to a partial fundoplication if dysphagia persists. Other complications- fundal wrap can become undone leading to recurrence of symptoms, wrap can slip into the chest (causing dysphagia and vomiting) – diagnosis is made by barium swallow and CXR shows a gastric bubble above the diaphragm.